By homeschool group hug Last Modified: March 2, 2013 Leave a Comment Any post on this site may contain affiliate links. If you use them, they cost you nothing extra. 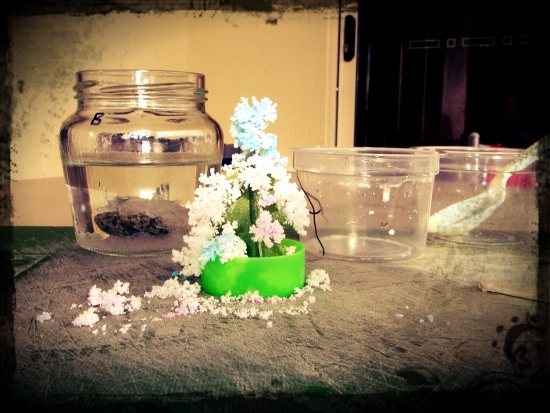 We make a small commission. Saturated solutions and crystallisation Easy to demonstrate at home, from a kit or with normal salt. I know a lot of homeschooling Mums ( and a few Dads) who are scared of science. That’s understandable, a lot of people didn’t get on too well with it in school. It would be a real shame for the children to pick up on that attitude, we need to dress it up, put a positive spin on it and make it fun. I was a scientist in my life before kids, so maybe it’s a bit easier for me, but I’ve found that I’m coping really well with introducing other subjects to the children that I used to know very little about. I never liked history, I wasn’t sure how I’d manage with my children. After a bit of reading around, online and from books, I’ve discovered that I LOVE history. So much for school! Go on, learn about science with your kids, you may learn to love homeschool science. You just need to get things straight in your head first, get a good book, find out a bit about the progression of learning that is important in science, you have to understand x before tackling z, sort of thing. I find this Core Knowledge Sequence document very useful in planning which topics to cover next. Then you just need to grasp the scientific method and the concept of controlled experimentation and off you go. You don’t have to become an expert overnight, just stay one jump ahead of the kids. Find some great scientific TV shows, Scope, Backyard Science, Deadly 60, anything David Attenborough, the kids love it. I have a degree in zoology and biological sciences, David Attenborough and Steve Backshall talk about topics I covered at university. Try searching You Tube for great little films on scientific topics. Here is one that we particularly loved on the periodic table, you just have to sing along! 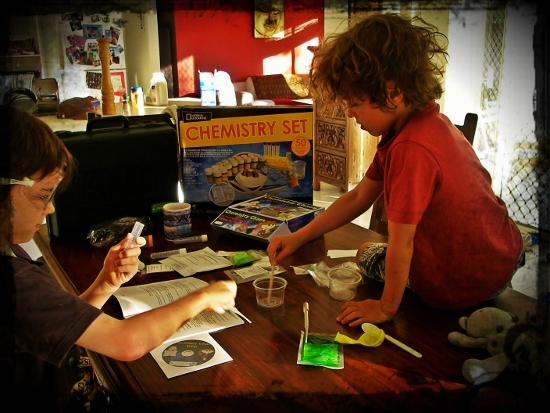 Teaching science at home is not just possible, it’s easy. Your kitchen, garage and garden are a great laboratory. You will have plenty of chemicals, reagents and equipment sitting on your shelves already, add a few amazing science toys, kits and games and you’re ready to go. You can even fill your home with full on laboratory equipment, mini lab coats and test tubes if you want to, it’s all available online. Before you break the bank buying equipment, give it some thought. Do you need measuring cylinders when you have kitchen jugs, beakers when you have old jam jars? It would be lovely to buy a microscope or telescope. Get the best you can afford, cheaper optics are not much more than toys and you will need to upgrade to a better one later. A cheap magnifying glass is a lot better than all the fancy bug catchers and watchers you can buy, their plastic lenses are poor. A top end electrical circuit set, although way above primary school level, will see the children through to the end of their education. If you’re worried about measuring and recording and graphing, don’t be. If you’ve got a thermometer and a clock you can collect some great information from what’s going on outdoors. Have a go, have fun with it and I hope you end up with smiling little faces just like these! 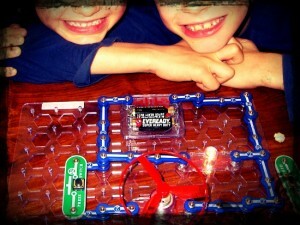 This circuits set is fabulous. Science and technology in one. The Kids Know it Network is brilliant for science, we particularly love their songs and the associated game Miamiopia. This free game helped get my eldest into reading and has allowed him to absorb scientific knowledge way beyond his years. Top 10 Cool Science Experiments. Science at home, for younger children. 52 Science Experiments to do at home. Wonder How To’s best You Tube Science Experiments. National Geographic Kids. Fun Science. Scistarter. An interesting idea that could be adapted for older kids. Citizen science research we can all get involved with.